I am super cheapskate most of the time. It drives my husband crazy. Most of the crafts I know are self taught, or learned from a video or two. I did have a teacher for knitting and crochet, the basic stitches anyway, the rest I picked up. I don’t really like taking classes. I get bored, I don’t always learn much, I hate being shown things I already know and want to get to the good stuff. That said I joined a site recently that costs $5 a month, it’s all craft classes, and I love it. The site is called Creative Bug. They are like a Netflix for crafters. The website has over a 1000 instructional videos and classes, for everything from tempering chocolate to crochet to kids crafts to cookie decorating to creative challenges. It’s all there. AND It’s all taught by people who know their stuff, top names in the industry. I used to teach craft classes at the local AC Moore, and let me tell you, not all teachers know what they are doing. I had people approach me asking how to teach a class because they’d been doing a craft for about a week (I’m not even exaggerating here! People have said that!) and wanted to teach. That’s not the case with this website though. Some of the top names in the industry are there, including a person idol of mine. I also love the variety there. In their drawing classes you can learn manga, doodles, lettering, and realistic styles. The same goes for the other crafts as well. Thy also cover all age and skills levels. There is basic knitting classes to learn to knit but there is also classes for more complicated techniques. If you already know the technique you can download just the pattern and get to work. There is also kids crafts! My son loves to sit down and watch a video or two on my computer! I also intend to take some of the projects to do with a homeschool craft group I’ll be doing. Since I spend money on it I care more about utilizing it. So often on pinterest or other websites you’re not invested, and you lose nothing by never doing a project. Sine I’m invested (even though it’s only $5) I am more dedicated to accessing the website and utilizing the ideas. Since they have top designers and teachers, and so many videos and classes it isn’t hard to spend time there. I am on the website almost daily. Every month that you are a member you get a class credit. You can use that credit to keep any one class you want forever! So if you decide down the road, or even right away, that you don’t want to be a member any more, you can still have some of your favorite classes at your fingertips for life! The supplies lists are insane or filled with expensive items. I’ve seen knitting and crochet projects use Red Heart. I’ve done drawing classes with a normal pencil or ink pen I had laying around. Some of the artists have high quality stuff, but most of them tell you to use what you have, or give you very affordable options. You get a two week free trial! When you join you do go ahead and pick your payment options, and enter your payment info, but they don’t charge you for a full two weeks. You can cancel anytime in that two weeks and you won’t get billed. All of the videos are very high quality and very well done. The materials are also very well done. The main way I like to use the site is the creative challenges! They have almost a year (maybe more than a year) of daily challenges for drawing and boosting your creativity. I’ve been saying for years that I should draw every day, but with not invested I never have. This $5 a month has me invested enough that I have drawn most days since joining! Sometimes I watch videos in advance and then draw it from memory later, sometimes I follow along, sometimes I just think “I better draw today, before the day gets away from me” and I just use a subject I know has a video but make it up myself. I also have watched videos on a few subjects I am interested in, but would never take a class on. I’ve also downloaded a few patterns for crafts that I know how to do, but want the pattern they have. Usually I watch videos during the afternoon while I’m otherwise a bit brain dead and tired. So instead of just loafing on the coach I’m still learning new things or getting new ideas. I also do my drawing challenges then, or while I’m waiting on dinner to boil/steam/bake. So I’m being productive instead of just wasting time. 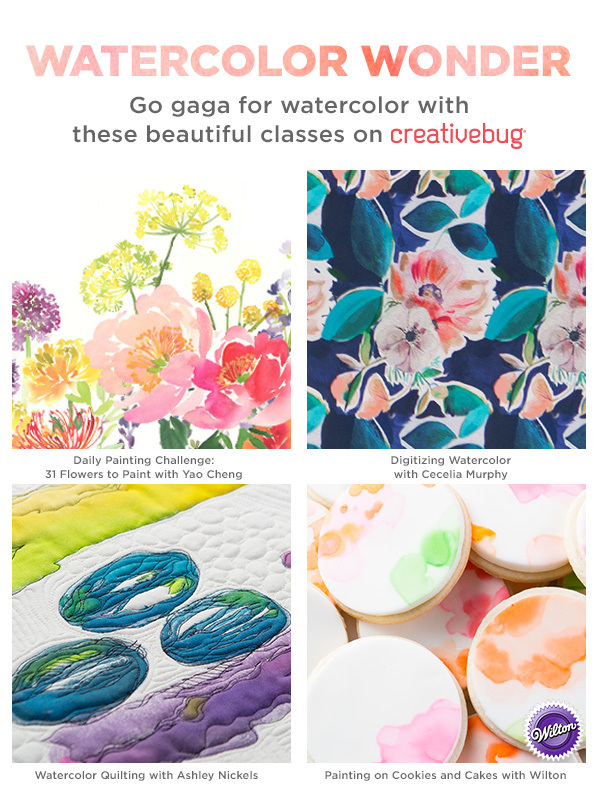 There is a deal where you can Get 1 Month of Creativebug For Just $1. Here’s some examples of their classes! 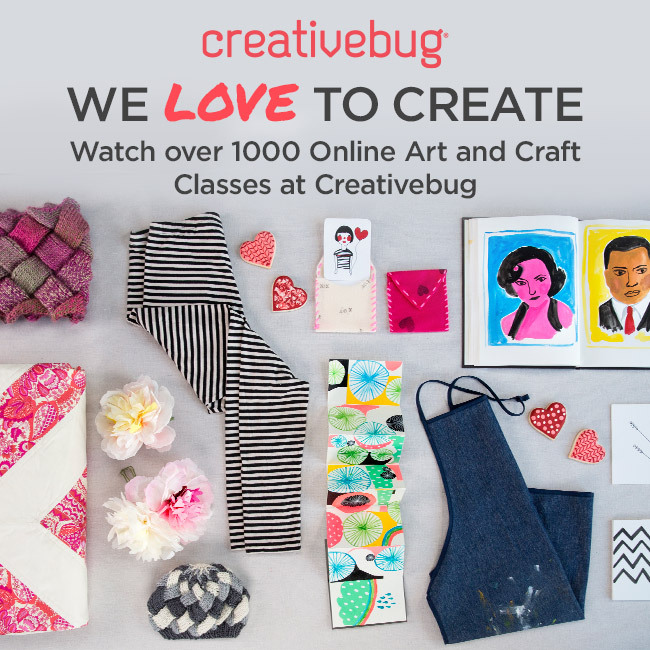 Full Disclosure- I did sign up as an affiliate for Creative Bug. If you join I will get a little money from the sale, at no additional cost to you. I am very picky about what companies I sign up for and only join those that I really love and want to talk about anyway.